+ + +: nail polish of the moment. nail polish of the moment. heyyyyya i've seen this before! I have this polish! It's an amazing color. 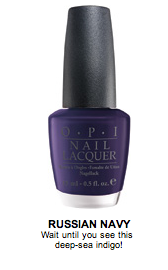 In the bottle it looks like it a dark iridescent purple, but the blue color on your nails is great! I also like O.P.I. Catherine the Grape.